A few weeks ago, I shared how I started taking CBD for anxiety. The very first product I tried was B.Chill honey from Beekeeper’s Naturals–and it’s still one of my favorites. If you’re not keen on the idea of vaping (that would be me!) and not a fan of taking straight up oil, B.Chill is one of the simplest ways to get a dose of CBD. It tastes good on its own and it’s easy to stir into tea, drizzle on fruit, or use in any way you’d use traditional honey. And, if you’re new to CBD, I should note: it does not get you high! B.Chill is made with hemp oil that’s rich in CBD, but has 0% THC so it’s non-psychoactive. You can also rest assured knowing that Beekeeper’s Naturals is made with hemp grown in the US and it’s tested for purity so you don’t have to worry about heavy metals and other contaminants that plague CBD products. Beekeeper’s Naturals isn’t just about honey and CBD, though. They offer a wide range of bee-related products. Another favorite of ours? Their Propolis Spray! Summer travel can expose us to all kinds of germs and propolis is fantastic for supporting immunity–not to mention its vitamins, minerals, and antioxidants. We’re teaming up with Beekeeper’s Naturals to give two readers a 125mg jar of B.Chill and a Propolis Spray. Enter using the form below. Good luck! Would love to win B Chill and give it a try! I need some B. Chill! I need some N. Chill! I would like to try the B.CHILL HEMP HONEY. I would love to try the wildflower honey – have a great day everyone! 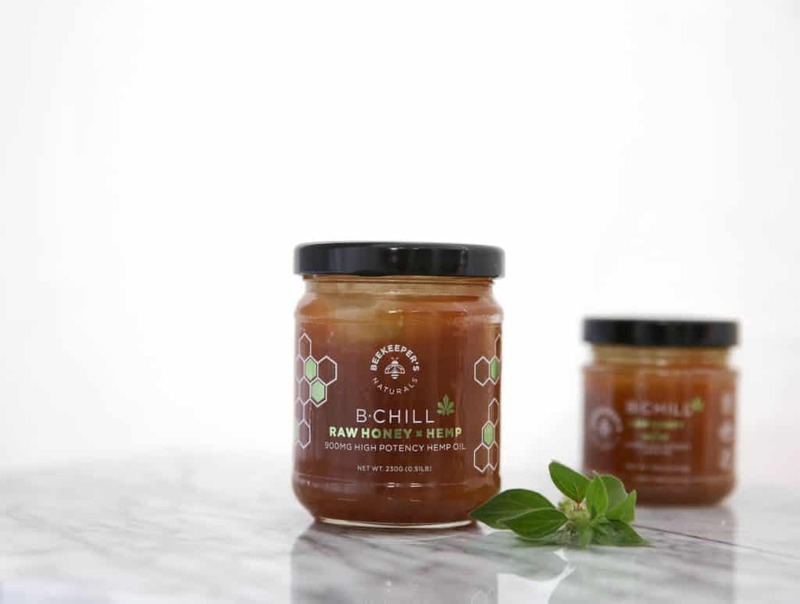 B.CHILL HEMP HONEY sounds like something I really need and would love to try. I would like to try the Wildflower Honey. I’d like to try the Pollen. I would like to try the Active Essentials. So many wonderful products! I’d most like to try the Liquid Gold bundle. I would like to try the Superfood Cacao Honey. I’d buy the B.CHILL HEMP HONEY!! I love honey so much. Excited to try all their stuff. I would like to try the BUCKWHEAT HONEY. I would love to try the raspberry blossom honey! Sounds delicious! I would like to try the Blxr Brain Fuel. I have fibromyalgia and it really affects my memory and concentrations so it would be interesting to see if that helps. I am curious about trying the B.LXR Brain food. I’m wondering how well it works. I’ll try anything at this point!!! I want to try the SUPERFOOD Cacao Honey the most. I would like to try the 100% raw honey. B.LXR Brain Fuel would be my choice! I want to try the Propolis Spray! It looks interesting! How do I pick just 1??? The B. Chill sounds amazing in the jar or honey sticks & the Cacao Honey sounds awesome too. I would love to try the honey sticks. I’d love to get the SUPERFOOD CACAO HONEY, sounds delicious. I would love to try the B LXR. I would love to try the B.Chill hemp honey for anxiety relief. i would love to try the honey sticks. they look really good. I’ve been really interested in trying Propolis, so the Propolis Spray definitely caught my eye. The Superfood Cacao Honey looks delicious, too. I would love to try the wildflower honey! The Propolis Spray sounds so interesting. I’ve never tried anything like that and would love it! I would love to try the B.CHILL HEMP Honey. Heard so many great things and would love to try some!! I would love to try the BUCKWHEAT HONEY from Beekeeper’s Naturals. SUPERFOOD CACAO HONEY. Everything looks terrific. Honestly, I would like to try the B. Chill honey the most. The raspberry blossom honey also sounds good to try! I’d like to try the wildflower honey. The B Chill Hemp Honey is the item I’d most like to try, but the Beegan Baker’s Bundle looks awesome too. I would like to try the hemp honey & also give to my hubby who is pain all the time. I would like to try all of their products but the one I would most like to try is the Blxr Brain FuelBlxr Brain Fuel. My brain seems to deteriorate a little more each year! :-) Thank you. I would most like to try the Superfood Cacao Honey from Beekeeper’s Naturals. I would try the BXLR brain fuel. It seems interesting. Thanks for the giveaway. I would like to try the Raw Honey Varietal Bundle. The supeefood cacao honey sounds delicious. Thanks for the giveaway. I would like to try the Blxr Brain Fuel! Sounds great! I’d try them all! I WOULD DEFINATELY LOVE TO TRY THE SUPERFOOD CACAO HONEY. I’d love to try the Superfood Cacao Honey. Thanks for the giveaway! Both products sound very interesting, especially the Hemp Honey!! I would love to try the B. Chill Hemp Honey! Everything looks amazing! I’d love to try the honey and Propolis spray. I would love to try any of their products! I would like to try the BKN Superfood Cacao Honey. I would like the raw honey varietal bundle. I would absolutely love to try the B. Chill hemp honey! I am absolutely intrigued by your B. Chill Hemp Honey and would LOVE to try it! I would love to try the Wildflower Honey. I would love to try the Liquid Gold bundle. Their products sound really nice.